John Matthew “Jack” Slattery, 80, a retired Air Force pilot and for many years a historian of helicopters, died March 6, 2008 at his home in Fort Washington, MD. Born in Bay City, Michigan, he served in the Marine Corps in the South Pacific during World War II. Recalled to active duty during the Korean War, he was evacuated by helicopter (an H-13) after suffering frostbite in South Korea. In 1954, he entered an Air Force aviation cadet program and was soon designated a helicopter pilot. He served two tours of duty in Vietnam and retired from the Air Force in 1974. 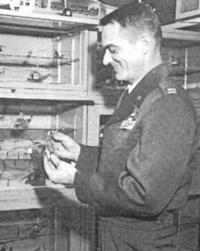 His military decorations included the Legion of Merit, the Distinguished Flying Cross, and the Bronze Star Medal. He consulted for the movie “Towering Inferno,” and the “Airwolf” television series, which ran from 1984 through 1987 and featured an advanced, supersonic military helicopter. In 2005, AHS presented him with its John J. Schneider Historical Achievement Award. He was a member of Helicopter Association International, the American Helicopter Society, the Royal Aeronautical Society, and the Twirly Birds.